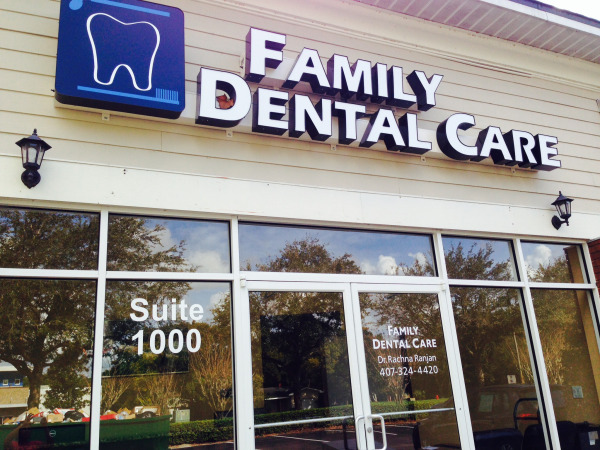 Welcome to Family Dental Care, located in Lake Mary, FL. When you visit our office, your healthy smile is our top priority. Our Lake Mary dentist, Dr. Rachna Ranjan, and our entire team are trained and ready to take care of all of your dental needs. For over 14 years, Dr. Rachna Ranjan has been providing high quality dental care to the residents of Lake Mary, FL and the surrounding communities of Sanford, Winter Springs, Longwood, and Heathrow. Our entire team is dedicated to listening and serving you with the personalized, trusted care that you deserve. We welcome you to our practice and look forward to building a lifelong relationship as your family's dental care provider. We offer advanced technology with the warmth and friendliness you’re looking for. Our patients find that we exceed expectations. From routine teeth cleanings to cosmetic dentistry and gum disease treatment, you will leave with a healthier and happier smile. With Dr. Ranjan’s help, you can experience peace-of-mind, knowing you’re getting the best dental treatment available. At Family Dental Center, we are committed to educating our patients on all of possible options for care. For example, if you have a missing tooth, we will discuss dental implants, dentures, and bridges. We ensure that you know all of your options, so that you can make the decision that works for you. In an effort to offer comfortable and conservative treatment methods, Dr. Ranjan utilizes soft tissue dental lasers. Dental lasers aid in precise gum contouring, they minimize the spread of infection, and expedite tissue regeneration and healing. We are pleased to offer our patients modern and effective treatments for all their oral health needs. Located in the heart of beautiful Lake Mary, FL., our dental practice can be conveniently reached by those traveling from the surrounding areas including Heathrow, Sanford, Longwood, and Wintersprings. Got a tooth ache, want to discuss alternatives to braces, or need to schedule teeth cleaning? Why wait any longer - Give us a call or make a dental appointment online today!